The so-called April 1975 “Ain el-Remmaneh incident” was the spark that set off Lebanon’s 15-year civil war. 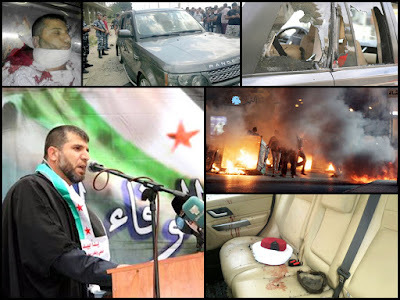 Sheikh Ahmed Abdul-Wahed was shot dead, along with his travel companion Sheikh Mohammed Hussein Merheb, in his Range Rover at an army checkpoint at Kwaikhat in Akkar, a district in the north Lebanon governorate. He was on his way to address a rally in the Akkar capital of Halba. The event was immediately called off. The Lebanese army promptly said in a communiqué it deeply regretted the incident, promising a military inquiry. The state commissioner to the military court, judge Saqr Saqr, later ordered the arrest of the three army officers and 19 soldiers who were manning the checkpoint at Kwaikhat. Abdul-Wahed, a 1969 native of al-Bireh in Akkar where he founded al-Noor Islamic school and charity, was devoted to helping Syrian refugees in Lebanon. He was close to the anti-Assad “March 14” alliance led by former premier Saad Hariri’s Future Movement. News of the killing by the army drove angry people to the streets of Akkar villages as protestors cut off roads with burning tires. Protesters blocked roads elsewhere in Tripoli, the Eastern Bekaa valley and the Beirut highway to South Lebanon as well as in the Beirut areas of Verdun, Mazraa, Tarik el-Jdideh, Beshara el-Khoury and Qasqas. Armed clashes overnight in Tarik el-Jdideh between supporters of the Future Movement and their rivals in the Arab Movement Party headed by Shaker Berjawi, an ally of the Syrian government, left three people dead and 15 wounded overnight. The fighting in Beirut was the most intense since May 7, 2008, when Hezbollah gunmen swept through Sunnite neighborhoods and torched the Future Movement’s TV station after the government tried to dismantle the group's telecommunications network. Lebanon’s Grand Mufti Sheikh Mohammed Rasheed Qabbani has declared three days of mourning over Sheikh Abdul-Wahed’s death. Future Movement MPs, including Khaled Daher and Marwan Hamadeh, said the incident was a targeted hit. "If shots were fired at the tires, we would say there was a mistake. But we consider this a direct targeting from the army," he told Reuters. "Frankly, we do not want to see the army here because it works at the service of the Syrian regime," he said. Future Movement leader Saad Hariri also pointed the finger at Assad "infiltrators" in the military for the deaths. "There are some infiltrators who want to use the military and its image to import the crisis of the Syrian regime to Lebanon in a desperate attempt to save Assad's regime from its inevitable end," he said. Abdelqader Abdul-Wahed, the slain cleric’s brother, echoed the sentiments in an interview with Lebanon’s MTV. "Unfortunately, we have some infiltrated elements in the Lebanese army, possibly officers who work for the Assad regime," he said. "I hope the army institution cleanse itself from these elements." After the Lebanese Army curbed the May 12-14 clashes between Tripoli's two adjacent districts -- the predominantly Sunnite “Bab al-Tebbaneh” and the overwhelmingly Alawite “Jabal Mohsen” – Lebanese Alawite chieftain Rifaat Eid talked tough at his Jabal Mohsen stronghold. Speaking in an interview broadcast the same day on Russian state news channel Rossiya-24, Assad put the blame for the Syria violence on the Arab Spring and said weapons bound for Syrian rebels were entering his country from Lebanon, adding: "And as I have said, if you sow chaos in Syria you may be infected by it yourself, and they understand this perfectly well." (See my May 17 post, “How Syria fire is creeping up on Lebanon”). He said the weapons are “moved first to Akkar, then to Wadi Khaled, ahead of their smuggling into Syria… Premises of charities run by Salafists and the Future Movement in Lebanese areas bordering Syria are being used to provide safe havens to al-Qaeda and Muslim Brotherhood terrorists to launch hit-and-run criminal operations inside Syria. The injured among them are treated under fake names in hospitals and clinics affiliated to those (Salafist and Future Movement) groups and funded by Saudi Arabia and Qatar.” (See my May 18 post, “Syria seen lighting the Lebanon fuse”). The north Lebanon turmoil, he says, shows Syria to be “in a hurry.” Within weeks of the attempt on the life of Lebanese Forces leader Samir Geagea that was meant to destabilize the Christian community, Damascus turned its gunsight on the Sunnites to export its crisis. 1. Lebanon can no more serve as Syria’s “lung.” Given persistent pressure from the U.S. Treasury, Lebanese banks are finding it increasingly difficult to launder Syrian money or handle financial transactions with the Syrian regime and its supporters. 2. Syria wants to use Lebanon as a bargaining chip. It is telling the Saudis that the regime’s confrontation with its Sunnites has now spread to Lebanon. It is also inviting the Americans to do a deal for the sake of regional stability.